Home Blog How Great was the Great Storm of 1987? How Great was the Great Storm of 1987? It is 30 years since the Great Storm of 1987. What would the impact be if the same storm hit again today and what if it were even greater? 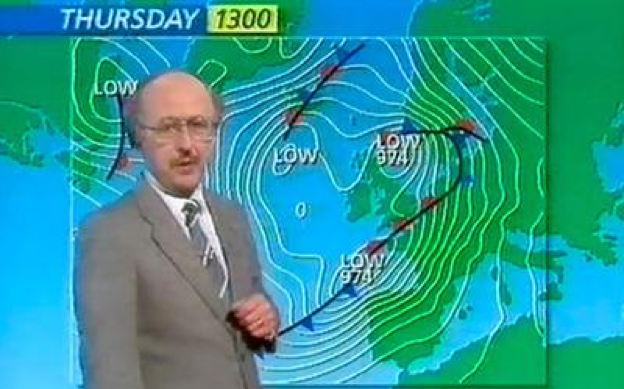 One of the most significant weather events to hit the UK was the Great Storm of 1987. Thirty years ago today, a violent extratropical cyclone brought wind gusts exceeding 120 miles per hour to the Sussex coast before travelling across South East England overnight. Much of the South awoke on October 16th to scenes of devastation not witnessed in generations. The storm claimed 18 lives, felled more than 15 million trees, wreaked havoc across road and rail networks and dislodged and even removed roofs and chimneys. Many areas lost power due to damage sustained by the National Grid, which shut down in several parts of the South East to avoid overheating. The impact of the storm was still being felt three days later with an estimated 250,000 homes without power. Insurers began to count the cost of the largest storm in living memory: widespread damage to homes, shop fronts in need of repair and many caravan sites were completely devastated along the coast. Shanklin pier was washed into the sea on the Isle of Wight and a ferry was blown ashore near Folkestone. The total bill for the UK insurance industry was circa. £1.4 billion. That was of course in 1987 and it is difficult to estimate the equivalent today due to increases in population, housing stock, inflation and claims expenses. But it does beg an interesting question: what would the impact be if the storm were to hit today? One method for estimating the impact is to map out the current industry property exposure, overlay the estimated wind speeds from the original storm in 1987, and evaluate the damage. Using wind speed data from the Extreme Windstorm Catalogue produced by the Met Office and its partners, overlaid on insurance industry exposure data from PERILs, which aggregates insurer exposure information, the loss for a ‘Great Storm 2017’ would be between £2.5-£3.2bn. A loss of this size would be significant for the insurance industry considering the combined total winter flood and storm losses in 2015 were £1.9bn. However, closer inspection of the map of winds for the storm suggests the UK was actually relatively fortunate in 1987. The storm moved over South East England, but later peaked in strength over the North Sea, meaning that the worst of the storm was not experienced over land. If the peak of the storm had instead tracked across Southern England along the M4 corridor and across London a much worse scenario could have occurred. Using the original shape and size of the storm, including areas that were out at sea, the footprint of the wind speeds can be moved to represent this alternative scenario. The data can then be adjusted to account for the inland effects of friction due to trees and buildings slowing wind down. Once this has been taken into account the damage to properties can again be estimated using the new scenario of winds compared to the original in the maps shown. 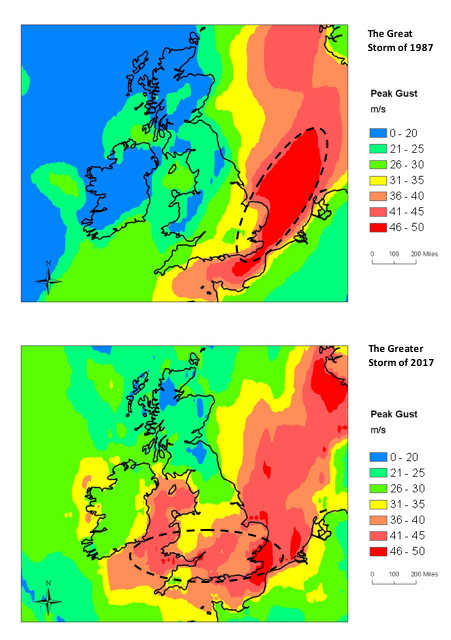 This alternative scenario, a ‘Greater Storm of 2017’, sees wind speeds increase dramatically in areas to the west and areas across southern and central England, which in 1987 missed the worst of the gusts. Calculating the damage for this alternative event produces an estimate for industry insured losses totalling £13.8-17.3bn. This scale of event would certainly trigger reinsurance covers for the UK and stress test the UK market which has not seen a significant wind storm since Daria in 1990. Economic losses would be much larger in addition to this and transport across the south and central parts of England would be severely disrupted. Due to the widespread damage across multiple towns and cities the emergency response required would be an immense coordinated effort by emergency services and government. When the storm struck in 1987 the insurance industry had very basic methods for assessing risk to natural hazards such as windstorms. Since then the development of catastrophe modelling has enabled insurance companies to evaluate risk with much greater insight. Through simulating catalogues containing thousands of different events over portfolios of property, models estimate losses for scenarios ranging from frequent to severe. These outputs support more informed underwriting and risk management. Regulatory requirements also ensure that insurers demonstrate they hold sufficient capital and reinsurance cover for rare but severe events that could cause insolvency. The majority of catastrophe models used in the insurance industry rely heavily on short term records of historical events to infer the frequency and severity of future damaging storms. With only a handful of powerful windstorms hitting the UK and Europe in recent history, claims information and meteorological records for high winds speeds are sparse. Using an alternative scenario such as the Greater Storm of 2017 allows us to pose a what if, that can help increase our understanding of tail risk. Comparisons such as these are important given the limited availability of historical data to work with and benchmark against. The Great Storm of 1987 was a large event that many still remember vividly. However, it can also be remembered as a storm that narrowly missed being a catastrophe on a much greater scale. “Earlier on today, apparently, a woman rang the BBC and said she heard there was a hurricane on the way… well, if you’re watching, don’t worry, there isn’t!”. The Met Office and weather forecasters have since learnt to be much clearer when communicating levels of risk to the public. In 2015 the Met Office began naming storms each winter to help raise public awareness. The advancement in supercomputing to feed numerical weather forecasting has also resulted in significant improvement in forecasting skill. Posted on 16th October 2017.